Breakout British singer Sam Smith’s debut album In The Lonely Hour debuted at the No. 2 spot in the U.S. and received much praise from the music press. 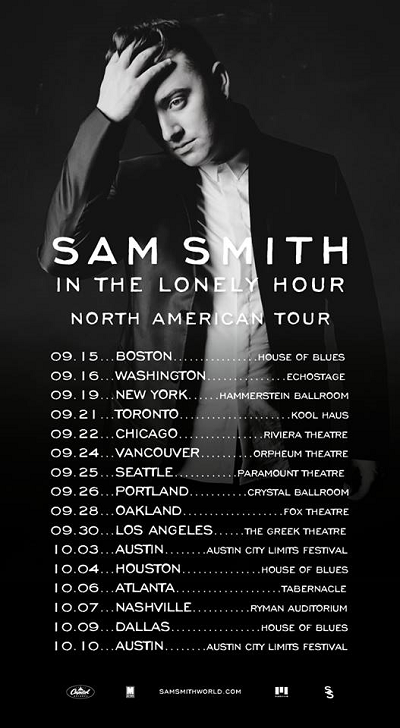 Smith showed why he’s been such a commercial and critical success with a two-night engagement at Los Angeles’ Greek Theater this week. The album is dark in content but uplifting in talent. Many celebrities have rallied in Smith’s corner as mega fans and come out to his shows in full force. Showing off his angelic voice to sold-out crowds, Smith started with his hit Nirvana, and the second his voice hit the mic the crowd jumped to their feet and roared. Smith is all about singing his songs for his fans and did not take a break at all except when he would talk to the audience and share the backstory to his songs. The moment of the night came when Smith sat on a stool with just the light from the spotlight above him and sang an acoustic cover of the late Whitney Houston’s How Will I Know. The crowd swooned with Smith and raised their lit cell phones in the sky to lament with him as he crooned through the classic lyrics. The show concluded with Smith’s smash hit Stay With Me. The whole venue was illuminated by cell phones and echoed by thousands of people singing along to their favorite Sam Smith tune. The feeling as a spectator in this moment, I will admit, would make the hairs on your arms stand up, your body lose itself in the music, and your eyes wouldn’t stand a chance at looking away. Sam Smith’s album is dark in content but uplifting in talent. His concerts in L.A. were the same. Let’s hope his classic voice is here to stay.